It is everything all about your project. To win it, we help you by delivering highly reliable real-time location system (RTLS) based on ultra-wideband (UWB), which can be quickly demonstrated in customer premises and subsequently easily scaled into the large complex industrial environment. Success is not only about precision. In order to guarantee best performance to your customer, our RTLS integrates complex UWB system management tools. Check positioning precision in real-time, record capture files for further analyses, change device configuration remotely or get system reports periodically. All these functions guarantee your success. To locate objects Sewio RTLS uses a set of hardware devices collecting UWB signals and transmitting them to the RTLS server, where the position is calculated by the location engine. The RTLS consists of Tags, Anchors and RTLS Studio SW. Anchors are installed at the ceiling in the area. Mobile Tags in regular interval transmit very short UWB signal, which is received by the ambient Anchors. The Anchors send the timestamps from the UWB signals via Ethernet or WiFi infrastructure to the RTLS server running RTLS Studio SW, which calculate the exact position and store data in the database. Positioning data are then available through the API. RTLS Studio SW also allows to visualize the real-time tracking and to analyze the stored data. Key benefits choosing Sewio RTLS for your project is outstanding system management, easy scalability and high precision. 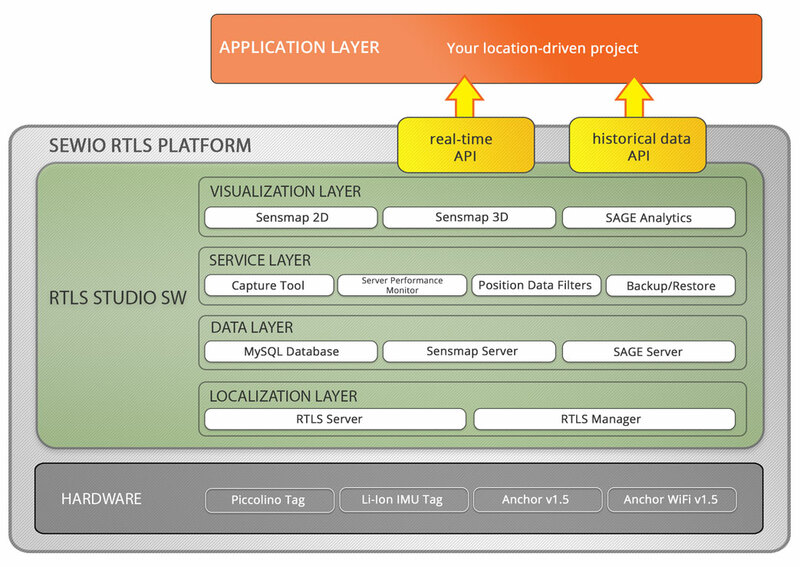 Main functional blocks of RTLS Platform are defined by corresponding platform layers. Data transmitted as UWB signal is obviously generated at Hardware Layer. UWB signal from Hardware layer is processed by Location Layer where position is calculated and filtered. Data Layer is responsible for location data storage and their representation for further visualization and analyses. At Service Layer the RTLS Platform offers tools to control and optimize the system performance. The real-time position data and analytics data is visualized in Visualization Layer. RTLS Platform can be connected to your application through the API with REST, Websocket or UDP stream interfaces. The Anchor is static device receiving UWB signals from Tags. A set of Anchors create the location infrastructure in facility. The RTLS Platform is fully scalable, allowing the unlimited expansion of area just by adding extra Anchors to the network. You can use just 5 Anchors for demonstration and after to add any number to scale into space. A wireless locator for detecting and reporting the real-time position. Personal Tag integrates the Piccolino Tag inside in order to guarantee the minimalistic design. It is powered by small coin battery lasting over 1 year. If person do not move, Personal Tag goes into sleep mode to save energy. Personal Tag can be delivered as the wrist band, conference badge or in clip version. Highly resistant Tags for demanding industrial environments. The big advantage of UWB technology is revealed once used in harsh environment. We have developed special housing allowing to place the small Tag into the metal objects without loosing performance. The Asset Tag integrates small Piccolino Tag and it is suitable for tracking pallets, metal coils, tools, etc. Rechargeable Tag with Li-pol battery with full set of inertial sensors (accelerometer, gyroscope, magnetometer, barometer, thermometer). The Tag is powered by a rechargeable Li-ion 600 mAh battery with prolonged battery life up to 5 years It can be fully reconfigured through the RTLS Manager. In addition, Tag has a mini-USB interface for charging and configuration, a power button and LEDs. Suitable for tracking forklifts, go-karts or for players tracking. RTLS Studio SW is all-in-one software package enabling smooth installation, deployment, maintenance, and control of the system. RTLS Studio SW comes as virtual image or it can run as stand-alone Unix application. There is no more toolboxes or Add-ons you need. All you need is prepared as one box.